For more information please refer to Flex/Design. Brands: Brands of Akzo Nobel; Dulux(UK), Dulux Valentine (FR, BE), Flexa (NL), expanded to other countries coming years. Images by: Sikko Valk, unless indicated otherwise. * Winner of the innovation award 'De Gouden Noot' 2016 (Gold). 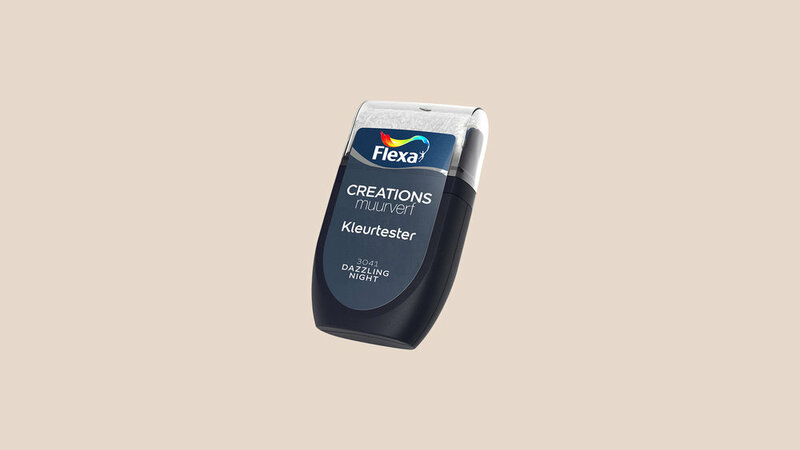 Design of the Dulux / Flexa paint colour tester; an innovative concept of a paint-container, paint-roller and packaging in one. The colour tester helps consumers test colours by enabling them to apply actual paint on their walls, before buying a whole can, in comparison to the traditional holding a small piece of printed paper to your wall and trying hard to imagine how it would look. With a squeezable body, comfortably shaped to the palm of your hand, and a small roller, painting is very intuitive, easy and making it fun to give a fresh look to your home. Seeing the final result with actual paint provides confidence in your choice of colour. The instantly recognisable, iconic shape & contour makes it stand-out on the shelves, and easy to compare other colour options in hand, perhaps even more tempting to try more than you originally planned for. To ensure you will paint with fresh paint, the label connects the bottle and transparent cap, and is broken when opened. A tamper-evident seal underneath the roller is to be removed to activate usage. So with one look at the tester you know you're making a good choice.